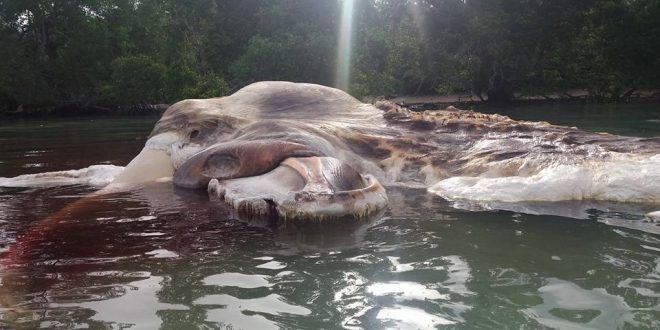 An massive unidentified sea creature is decomposing of the coast of the Seram Island in Indonesia. The colossal carcass was found on Hulung Beach on the westside of Serum Island on Tuesday night by a local man. In the darkness, Asrul Tuanakota, 37, initially mistook the huge fleshy blob for a stranded boat. Close-up footage shows a twisted mass of discoloured skin that is a rich rusty brown-red into the waters. Since its discovery, locals have been at odds as to whether it’s a giant squid of the remains of a whale. This is not the first time an unknown mass has been found around a shore line. In February this year, a giant white hairy blob surfaced on a beach in the Philippines. Weighing two tonnes and measuring almost 7m in length, locals speculated the creature was some sort of undiscovered dugong. The carcass is actually a whale, which took on an alien-like appearance thanks to decomposition. In March last year, locals in Acapulco, Mexico filmed a grisly and morbidly fascinating video of a giant carcass which washed up on the beach. Local fire chief Sabas de la Rosa Camacho said the creature could either be a giant squid or a whale.